Dr. Mudryk has utilized many adjusting instruments over the years. Not one alone serves the purpose of everything necessary to take care of all patients. From the original Activator, to the Torque release instrument, to the Impulse, and now the IMPAC Arthrostim adjusting instrument, Dr. Mudryk uses them all, day to day. Due to the various areas that Dr. Mudryk treats, we utilize these various instruments to best suit the patient’s needs as safely and effectively as possible. We have found instruments to be a favorite over people even if they enjoyed the twisting and cracking of their previous Chiropractor. The Impulse and many other instruments were born out of more than a decade of research and engineering. Not only to they do instruments adjust the spinal bones more effectively than the hand, but they also effect the surrounding muscles quite effectively. These frequencies that these instruments utilize also stimulate mechanoreceptors in the surrounding muscle to relax and reset their tone. After all, your bones are held in position by ligaments and muscles. Imagine that your nervous system and spinal cord as a guitar string. If it is too tight or too loose the tone of the information is altered. Or you could compare it to the volume of music. If the volume coming out of the speaker is too loud it causes distortion, this type leads to muscle spasms, internal organ complaints, musculoskeletal stresses and diminished immune response. Too low a volume, your body is then unable to receive critical messages, showing up as sluggishness, low energy, reduced performance and poor muscle support. Torque Release looks to correct these problems by normalizing and balancing the function of the nerves, spinal cord, and brain. 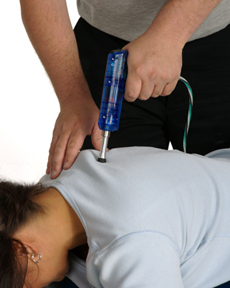 The primary intent of Torque Release Technique is to reduce blockages and tension of the entire spinal system, to release trapped unresolved patterns in the body/mind and facilitate reintegration of the nervous system, allowing a greater expression of ones healing and performance capabilities. This technique is the primary technique of Dr. Mudryk and is the technique used to maintain wellness in those who want to stay healthy for the rest of their lives. After each adjustment, the body is given time to process the change. Correction continues with your body’s natural movements and breathing. It is simply amazing how such specific light forces cause such a drastic change within the body. This is due to the ability of the body to learn to make its own corrections where we haven’t even provided an adjustment. Healing progresses with repetition and frequent visits during the initial intensive and corrective care phases. During the wellness phase, since your body has learned and has memory, the adjusting process is simple, quick, and powerful.